Some Irish hotels lean heavily on the historical atmosphere, but we’re always happy to find one that’s comfortable acknowledging the passage of time. 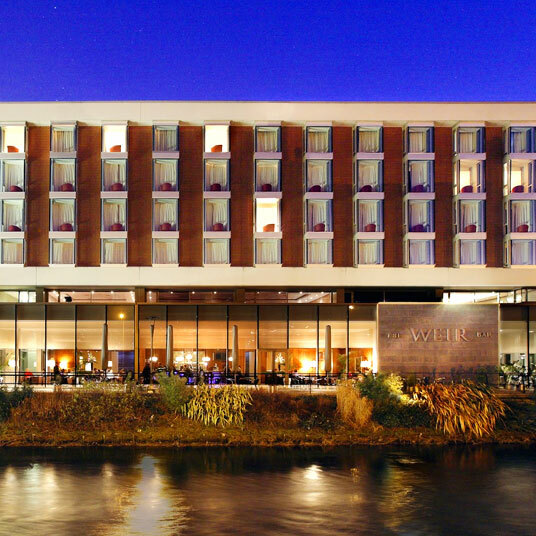 In the city of Cork, the Irish Republic’s southern seaport, there’s plenty of heritage to hold on to, but there’s also a healthy dose of modern luxury hospitality, if that’s the sort of thing you’re in the market for, in the form of the River Lee Hotel. No extra points for guessing the name of the river whose banks the River Lee Hotel hugs. It’s a slightly incongruous sight, this sleek modern building on the edge of this storied river, but once inside the interaction between the hotel and its setting becomes clear — there’s a coziness about the River Lee that’s all too often lost in contemporary-style hotels, and if it’s not too obvious to bother pointing out, there’s nothing better than a big modern picture window for a hotel room with a pretty view. The hotel’s bistro and bar are as contemporary as their setting, and the River Lee contains masses of conference space — there are far worse places to be holed up for a meeting. There’s also a day spa on the first floor, plus a fully equipped gym and wellness center, complete with 18-meter pool.